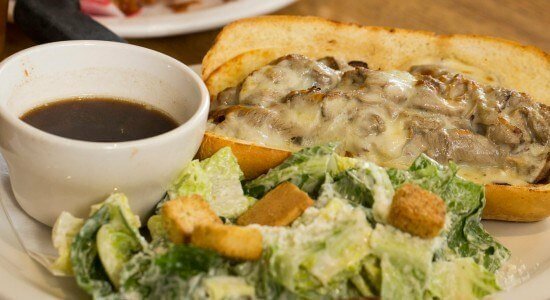 Roast beef warmed slowly in French Onion broth topped with melted Provolone cheese on a French baguette. Served with a crock of French Onion broth for dipping and a small Caesar salad. Served over top of white toast with mashed potatoes, gravy and a vegetable. USDA choice pastrami sliced deli thin, served on Rye bread with Fries and Cole slaw. 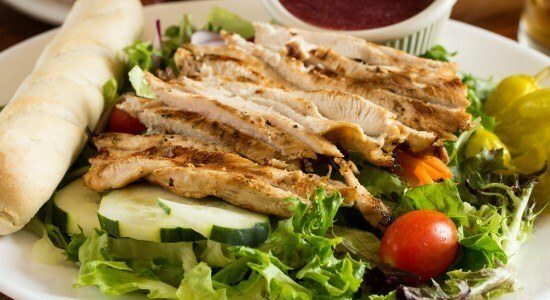 Marinated grilled chicken breast mixed with Caesar salad wrapped in a flour tortilla. Served with Fries and Cole slaw. Marinated grilled chicken breast mixed with Applewood smoked bacon, Cheddar, lettuce, tomato and mayonnaise wrapped in a flour tortilla. Served with Fries and Cole slaw. Roast beef heated “Pit style” on the grill, topped with melted Muenster cheese and Bistro sauce. Served on a seasoned French round roll with lettuce and tomato. Served with Fries and Cole slaw. Our take on a Reuben ~ USDA choice pastrami sliced deli thin, topped with onion, melted Swiss, mustard and slaw on Rye bread. Served with Fries and Cole slaw. Marinated grilled chicken breast topped with Applewood smoked bacon and melted Cheddar. Served on a Brioche roll with Fries and Cole slaw. Marinated grilled chicken breast on top of a chopped house salad mixed with Sesame Ginger Vinaigrette and topped with Goat cheese crumbles, dried cranberries and chopped walnuts.